My photos for the weekly photo challenge come from my visit to Kew Gardens. The weather was so glorious that visitors and school groups chose to eat outside in the beautiful surroundings. Kew Gardens are in Richmond, London and we went there yesterday for a Spring time coach trip with Carers Gloucestershire. This is a wonderful charity that can be a real lifeline for both carers and the cared-for. For myself it provided a very rare opportunity to go somewhere beautiful with my husband and enjoy a stress free day. The volunteers and staff of Carer’s Gloucestershire did everything they could to make the day as relaxing as possible. I am deeply grateful to them for their organisation, their practical support and the funding that subsidised the trip. The weather was glorious with blue skies and warm sunshine ~ just perfect for seeing the abundant cherry blossom, exotic magnolia and camellia, fabulous fritillaries, drifts of daffodils in the gardens, and woodlands blanketed in bluebells in this glorious and historic park. Apart from the beautiful plants and impressive landscapes at Kew, we saw some lovely lakes with swans nesting, ducks flying or ambling about, and grumpy geese arguing with each other. We also saw Jays, peacocks, and lots of noisy green parakeets, which have taken up residence in the trees and are the cause of lots of damage to fruits and buds we were told. We loved the historic buildings and mock roman ruins situated near the gateways, which also sport beautiful sculptures. My favourite was the Unicorn near the Victoria Gate. There are some truly enormous glass buildings, including the world’s largest Victorian greenhouse, which was closed for restoration while we were there. I can’t wait to see it when it opens. But the Palm House, Orangery, and various conservatories were open to view. Sadly, it was impossible to see everything in just one afternoon. I walked miles as it was and only managed to see about a quarter of the gardens. There is a road train which does a tour taking an hour and a half which would have been a good idea, but there is nothing better than just walking around soaking up the sights, sounds and smells of this beautiful park. I really hope to be going back! Landscape is the theme for the Weekly Photo Challenge and it inspired me to get out and about on a literary trail with my little Panasonic camera. So many of our great writers were, and still are, inspired by the landscape. I know I have previously blogged about Thomas Hardy’s Dorset, and I have probably exhausted my readers with photos of Shakespeare’s Stratford on Avon, so just for a change, I set off for Gloucester, and The Tailor of Gloucester’s house in particular. I chose this because 2016 marks the 150th birthday of Beatrix Potter who wrote a delightful story about the Tailor of Gloucester following her success with The Tale of Peter Rabbit and the Tale of Squirrel Nutkin. I am auditioning this month to be part of a community choir that will perform in the Everyman Theatre’s professional production of The Tailor of Gloucester and I could not be more excited. The theatre, in my home town, is putting on the play to celebrate the 150th anniversary, and to celebrate the fact that a new Beatrix Potter story has been discovered. The new book, called The Tale of Kitty-in-Boots, is to be published on 1 September 2016. Beatrix Potter was passionately interested in conserving and protecting the landscape to be enjoyed by everyone. She was a great supporter of, and benefactor to, what is now the National Trust, whose Motto is the title of this blog~ “For ever, for everyone”. She was so generous to the trust in fact that when they moved their headquarters to the site of the Steam Museum in Swindon, they named it Heelis, which was Beatrix’s married name. Altogether Beatrix bequeathed to the nation the 15 farms she had bought in the Lake District comprising over 4000 acres of land, farm buildings, cattle and flocks of rare Herdwick sheep. The building which now represents the Tailor of Gloucester’s house and shop can be traced back to 1535. It is in a historic cobbled street which leads through an ancient archway into the cathedral grounds. Having been through many changes, the building was eventually bought by Beatrix Potter’s publisher, Frederick Warne and Co Ltd in 1978. Using the illustrations which Beatrix did for the story, they replicated her vision of the inside and front of the building. The actual event did of course have a much more logical prosaic explanation than the wonderfully magical one imagined by Miss Beatrix Potter. There was an actual tailor in Gloucester called Mr Pritchard who worked in a building at the end of the lane leading to the Cathedral. He was young and very keen to succeed. He did have an order for a very important client which he had not managed to complete. He left the garment all cut out when he closed up his shop on Saturday lunchtime ready to be finished on Monday. However, his two assistants, knowing how worried he was about the garment, came back over the weekend and finished it beautifully for him. Poor Mr Pritchard, who had obviously been worrying all weekend was amazed when he found the garment completed so beautifully. In fact he was so surprised that he put a sign in the shop window saying he believed fairies had sewn the garment. It was some time later that his assistants admitted their part in the mystery and his wife eventually broke the story. But of course Beatrix had elaborated on the event as only she could, making it Christmas and the poor tailor ill. It is believed that she actually used her Gloucester friend’s coachman, Percy Parton, as the model for her illustrations of the tailor. Her other illustrations were drawings that she had done in and around Gloucester and Harescombe Grange. The most identifiable picture is of College Court, the lovely old lane leading from Westgate Street to St Michael’s Gate, an ancient entrance to old Abbey, now the Cathedral precincts. Beatrix chose number 9 College Court as the setting for her tailor’s shop and this is the building which Frederick Warne and Co Ltd purchased and restored just as Beatrix had imagined it in her illustrations. Below are some of my photos from the actual shop. Do enjoy some landscape photos from around the Cathedral Grounds and the Gloucester Docks close by the Tailor of Gloucester’s shop. As we will be celebrating Valentine’s Day this weekend, I thought I would post about my favourite Romantic poet. Bless him, Keats died when he was only 25 years old but, in a truly inspired period of just three and a half years, he produced some 150 poems. He said that love was his religion. It is said that his best poetry was written in the last nine months of his life, when he was madly in love with Fanny Brawne, his neighbour in Hampstead where he had lived. To follow the WPC theme for this week, which is “Life Imitates Art”, I have added an extract from one of his poems to a photo I took of the River Avon in Stratford, where I often took shade for whole summers on school holidays. Keats (1795-1821) died in Rome when he was just twenty-five years old. He had left his home in London’s Hampstead to seek a better climate, hoping this might cure him. But he left behind some of the most exquisite and moving poetry ever written. Before he gave his life to poetry, he had qualified as a surgeon-apothecary at Guy’s Hospital in London. But he had to give that up as his health was fading. There is a beautiful bronze statue of him in the garden of the hospital, which was unveiled in 2007 by another wonderful poet, Andrew Motion. I went to visit it with two of my dearest friends. Keats famously said, “Poetry should be great and unobtrusive, a thing which enters into one’s soul, and does not startle it or amaze it with itself, but with its subject”. But of course he is remembered and he was truly loved by Fanny although her family disapproved. She wore the ring he gave her until the day she died. There was a film called “Bright Star”, starring Abbie Cornish as Fanny, and Ben Whishaw as John Keats, released in 2009. I haven’t seen it so I can’t say whether it does him justice. But if you would like to see a clip the link is here. St Saviour’s Wharf. This is the area Charles Dickens knew well and he used it as the site of Bill Sykes’ murder! This is one of the most vibrant pieces of printed cotton I have ever seen. It was made by Tibor Reich and I have one of the original panels, which were made for the opening of the Shakespeare Centre at Stratford on Avon in 1964. The Centre was opened to commemorate the 400th anniversary of William Shakespeare’s birth. Following his parents’ divorce, Tibor went to live with his grandmother and immersed himself in drawing, painting and photography. Until, in 1933 at the age of 17, Tibor went to Vienna to continue his studies. Already artistic, his talents blossomed in the creative atmosphere of pre-war Vienna. He studied textile design and technology as well as architecture and poster design. But as Nazism spread, Tibor left Vienna for England, where he went to Leeds University to continue his studies in textile technology and woven design. Tibor brought the vibrancy and colour of his homeland, of Hungarian folk music and peasant costumes, as well as the beauty of nature, to the UK in his work. And, not long after leaving Leeds, he moved to Warwickshire and set up his own woven textile design business in Cliffords Mill using old hand looms that he repaired and renovated. Being totally original, he quickly established a good reputation, and worked on the highest profile contracts. In fact it is true to say he revolutionised textiles in post war Britain with his use of colour, pattern and texture. By the 1950s Tibor’s textile weaving business was well established and he expanded into printed designs. His projects included the Royal Yacht Britannia, Concorde, The Festival of Britain and the Shakespeare Memorial Theatre as it was then called. Here he designed and created curtains, wall hangings and carpets each named after a Shakespearean character. He also produced his own range of pottery called Tigo ware and designed a most unusual house for his family which was very innovative and modern. I visited him here in the 60s as a teenager, with my mum who was in Stratford art circle and seemed to know everybody! I was amazed by the huge onion shaped open fire which stood in the centre of the room and went right up through the house to the roof. I had certainly never seen anything like it. I visited again last week and took some photos. I believe the house has been renovated and I didn’t see inside, but the garden with its earthen embankment is established now and the fir trees are huge, providing a very useful privacy screen. Tibor did not like the idea of fences and walls, preferring natural boundaries. In 1964 he helped to furnish the brand new Shakespeare Centre, which is in Henley Street adjoining Shakespeare’s birthplace, for its opening to mark the 400th anniversary of William Shakespeare’s birth. And this is where our paths crossed. I have written before about the 1964 celebrations, which were undoubtedly one of the highlights of my life. I worked at the Shakespeare Centre and the sights and sounds produced there I will never forget. Shakespeare’s plays on a loop, pomanders and dried petals creating the perfumes of the Tudor age, all brought Shakespeare to life. Added to that was the music of the age and Tibor Reich’s exquisite carpets, curtains, textile panels and wall hangings, some of which are still there today. The tapestries and wall hangings evoked so brilliantly the scenes from the plays I loved, especially the Age of Kings panel. This material, showing the kings from Shakespeare’s plays, was produced as stage curtains. Panels of it were created in several vibrant colours, red, gold, orange, blue etc. I am lucky enough to have the original red version as a wall hanging. It was designed by Pamela Kay and made by Tibor Reich in 1964. I also have a detail from A Tournament and an original of “garrick Jubilee”. Recently, a new gold curtain was put up in the historic Becket chapel at Holy Trinity Church. The chapel is dedicated to the martyred Archbishop of Canterbury, Thomas Becket, who was assassinated in Canterbury Cathedral in 1170. I went to see it last week. The golden fabric was commissioned for the chapel by The Friends of Holy Trinity Church and comes from the Tibor archive of 20th century design stored in Stratford and in the Victoria and Albert Museum in London. And you can even see a clip of Tibor Reich and see him at work here. More of his work is on display at the Gordon Russell Design Museum in Broadway until 12 October, and at the V&A Museum in London. The Tibor Reich family, son Alex and Grandson, Sam hold an archive too which they are currently using to relaunch the Tibor Ltd brand. They are lucky enough to still live at Tibor House in Avenue Road, Stratford on Avon. It is a beautiful tree lined road near the open countryside on the way to Warwick. This year, 2016, marks the 400th anniversary of Shakespeare’s death. I know that the whole town of Stratford on Avon is busy preparing for the massive celebrations in April. I can’t wait to be there to join in the festivities and see what Stratford can do to match or better the celebrations of 1964. I have never been to a reunion before but this gathering was one I could not miss. It was to celebrate the 40 years that St Thomas More Primary School has been open. Having worked there for 16 happy years, I was keen to meet up with old colleagues and past pupils. I left in 2001 so I was also interested to see how much the building had changed to accommodate all the educational innovations that have taken place. And change it had! The entrance hall which used to be a small library, is now like a hotel lobby with a rather swish curved desk where the secretary works in an open plan office. The hall and kitchen have not changed at all, but the classrooms were very different. There seemed to be fewer desks and chairs for pupils and no large desk for the teacher. But the biggest change for me was NO BLACKBOARD! On the walls were white screens/boards, which presumable are linked to the bank of keyboards below. No huge computers now either, just small tablets (of the electronic kind) for every child. What a transition! I was flooded with nostalgia at the memories of chalkdust, board rubbers and metre long board rulers, protractors etc. In the corridor, there used to be a small special needs area for individuals or group who were struggling to keep up, or needed to be stretched. Now, that area is used by language specialists to help the many children for whom English is not their first language. Of course most of the old team who worked at the school still get together now and again for coffee mornings, walks and meals out. But we don’t often get to see past pupils. It was a revelation and a joy to see so many of them there. Most of those who attended are now in their 30’s with careers and children of their own. Without exception they all had many happy memories. The highlight of the evening for me was being back together with the A team ~ The first Headteacher, Arthur Beadle, his deputy, Hugh Bradley, and myself, who made a great trio even if I say so myself. I followed Arthur to become the second Headteacher in the school. Other highlights included seeing old photos on display, and being hugged by a tall handsome 36 year old man carrying his child. He, who shall be nameless, apologized for being such a naughty boy when he was a pupil. He remembered spending a lot of time outside the Head’s office door! He now has his own business and is very successful so he must have learned something! In previous blogposts I’ve described my love of water and written about days at the seaside, by rivers, or admiring springs and waterfalls and lakes that are special to me. I could be happy near any of them. Beside water I can relax and be at peace. I am often inspired to write by the sheer beauty and elemental power of water. But today I would like to bring canals and docks into the mix. Being born near the great River Tyne, I have been fascinated from the earliest age by ships, bridges, and the industrial buildings that line the banks around docks, ports and quaysides. Of course many have now been lost to us through disrepair. Others have been restored as wonderful museums, like the Gloucester Waterways Museum, or art galleries like the Baltic Mill in Gateshead. Many have been converted into luxury homes and offices like Butler’s Wharf on the River Thames in London. But some have just aged gracefully, and stand majestically observing the changing world around them. One such building, close to where I live, is the old ‘Llanthony Provender Mill’ or ‘Foster Brothers’ Oil and Cake Mill’ on Baker’s Quay. It faces the Gloucester and Sharpness canal, which is served by Gloucester Docks. Opening in 1862, the 6 storey warehouse played an important role in the industrial development at the docks in the late 19th century. In fact it is listed by English Heritage because of its important place in Gloucester’s history. Originally, the mill crushed linseed and cottonseed, extracting the oil from the seeds and then forming the remainder into seed cakes for cattle feed. According to the civic society, the business remained in the hands of the Foster family for 4 generations, until 1945, when it was sold to West Midland Farmers as a storage and distribution depot. In the last two decades much of the area has been bought up by developers and some areas have been dramatically changed by the building of the shopping centre and the College on opposite sides of the canal. However, so much is unchanged, that the area has become a magnet for film makers who use Baker’s Quay as a film set. Last year Tim Burton’s film, ‘Through the Looking Glass’, was filmed there. It starred Johnny Depp, Anne Hathaway and Helena Bonham-Carter. It was an amazing sight with Tall Ships in the misty docks ~ very atmospheric. Sadly I was not invited to be an extra on this occasion, disappointing as they filmed on my birthday! The warehouses at the docks are all built of red brick several storeys high. Inside there are wooden beams and cast iron pillars. Outside they look very impressive with lots of small windows covered with metal bars. Many of the warehouses still have faint painted signs showing their original dates, names and uses. They were mainly for storing grain or salt and had wooden loading bays facing the quay. Some have very impressive covered areas supported by pillars jutting out to the canal or quayside. The docks area, the bridges, and the warehouses are utterly fascinating to me. I have delighted in taking my grandchildren over there by car, bus or train over the years, then going on boat trips down the canal to Sharpness. Thankfully I have taken lots of photos too as last weekend (3rd October) there was a dreadful fire which partially destroyed this wonderful historic building. The local people are devastated by the loss of this much loved building, and local photographers and artists have been sharing their thoughts and feelings. 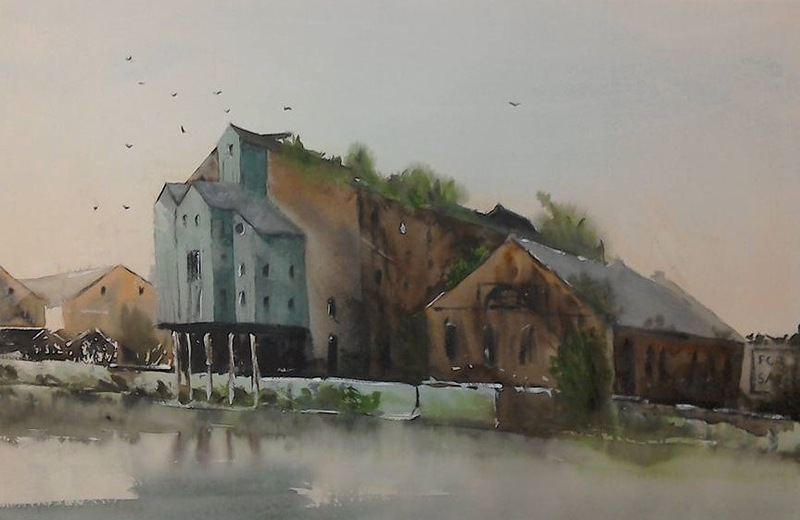 One local artist, Claudia Araceli was drawn to go over to the docks and paint that very building on the day that it was destroyed. She was there until early evening completing a beautiful painting before leaving at 6.45pm. The fire caught hold at 9pm and took fire crews all night to extinguish. The gallery below is a general view of the Gloucester Docks area and some of the boats and buildings there.